The Index Vector block is a special configuration of the Multiport Switch block in which you specify one data input and the control input is zero-based. The block output is the element of the input vector whose index matches the control input. For example, if the input vector is [18 15 17 10] and the control input is 3, the element that matches the index of 3 (zero-based) is 10, and that becomes the output value. To configure a Multiport Switch block to work as an Index Vector block set Number of data ports to 1 and Data port order to Zero-based contiguous. For more information about the Multiport Switch block, see the Multiport Switch block reference page. Control signal, specified as a scalar. The control signal can be of any data type that Simulink® supports, including fixed-point and enumerated types. When the control input is not an integer value, the block truncates the value to an integer by rounding to zero. For information on control signals of enumerated type, see Guidelines on Setting Parameters for Enumerated Control Port on the Multiport Switch block ref page. If the control signal is numeric, the control signal cannot be complex. If the control signal is an enumerated signal, the block uses the value of the underlying integer to select a data port. If the underlying integer does not correspond to a data input, an error occurs. First data input, specified as a scalar or vector. The port is labeled 0 when you set Data port order to Zero-based contiguous, and labeled 1 when you set Data port order to One-based contiguous. The input data signal can be of any data type that Simulink supports. The block outputs the selected value from the input data vector, according to the control signal value. The output is a scalar. Specify the type of ordering for your data input ports. Zero-based contiguous — Block uses zero-based indexing for ordering contiguous data ports. This is the default value of the Index Vector block. One-based contiguous — Block uses one-based indexing for ordering contiguous data ports. This is the default value of the Multiport Switch block. Specify indices — Block uses noncontiguous indexing for ordering data ports. This value is supported only for configurations with two or more input data ports. When the control port is of enumerated type, select Specify indices. If you select Zero-based contiguous or One-based contiguous, verify that the control port is not of enumerated type. This configuration is deprecated and produces an error. You can run the Upgrade Advisor on your model to replace each Multiport Switch block of this configuration with a block that explicitly specifies data port indices. 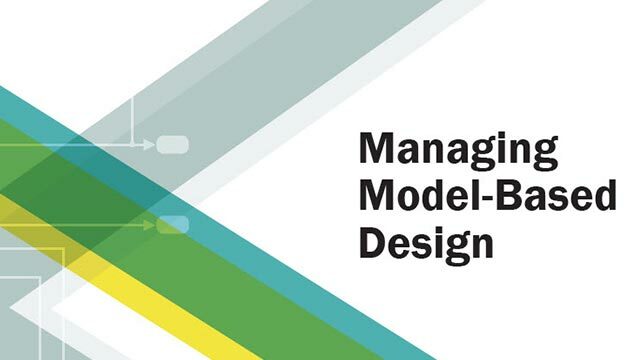 See Model Upgrades. Selecting Zero-based contiguous or One-based contiguous enables the Number of data ports parameter. Selecting Specify indices enables the Data port indices parameter. Specify the number of data input ports to the block. To enable this parameter, set Data port order to Zero-based contiguous or One-based contiguous. Select this check box to require that all data input ports have the same data type. When you clear this check box, the block allows data port inputs to have different data types. Inherit: Inherit via back propagation — Uses the data type of the driving block. Select this check box to allow input signals with different sizes. On — Allows input signals with different sizes, and propagate the input signal size to the output signal. In this mode, the block produces a variable-size output signal. Off — Requires that all nonscalar data input signals be the same size. How the Index Vector block works with zero-based and one-based indexing. 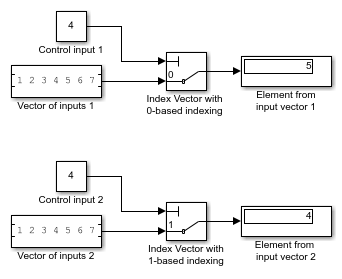 For more information about HDL code generation, see Index Vector.